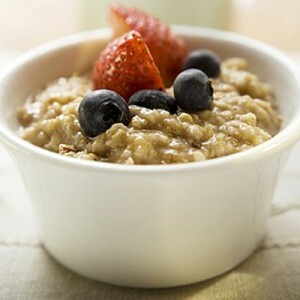 Can you lose weight by eating high fiber rich foods for breakfast? On the “SusieQ FitLife: Arms of a First Lady” DVD, bonus feature “Watch Your Mouth!” in the kitchen with Wellness Coach Sal Fichera; SusieQ shares her personal eating preferences as well. These guidelines will help you be on your way to “Get a FitLife”. Published Research in the Journal of American Dietetic Association has also shown that incorporation of a high fiber cereal to the daily meal resulted in more weight loss than in the group who only cut down calories. The study involved comparing three weight-loss strategies: exercise only; exercise plus a reduced-calorie diet that emphasized whole-grain cereals; and exercise plus a low-cal diet that included no cereals. Do you consume more calories than you burn during exercise? Oh my goodness! Have you begun to exercise at all yet? Whoa! Keep in mind while you “Watch Your Mouth” that weight loss equates to cutting down on high dense calorie foods. In order to lose weight, you must be more active to burn calories & fat to attain your weight-loss goals! Stay tuned, as SusieQ will break down exercise & sporting activities to help you achieve these goals! Excellent work. Great tips, very informative and I loved the video! Thank you so much for sharing it. YUMMY! I so appreciate you taking the time to read the healthful post Mr. Weightloss! I will be sure to check out your site as well! Much appreciated!